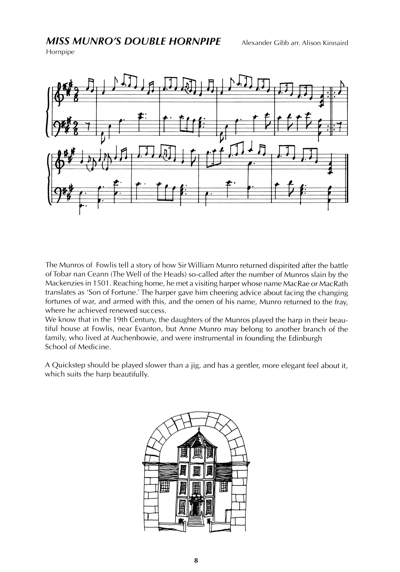 The North-East Collection: Following on from the Lothian Collection, this book is the second in a series, presenting melodies which come from the 'big houses' and great families of Scotland. In this case the area includes the coastal fringes of the North east - around the Moray, Dornoch, Beauly and Cromarty Firths. Most of the 25 tunes featured date from the 18th and 19th centuries. This is a collection of 25 tunes arranged for the Scottish harp by Alison Kinnaird. It is the second in a series, presenting melodies which come from the ‘big houses’ and great families of Scotland. In this case the area includes the coastal fringes of the North-East - around the Moray, Dornoch, Beauly and Cromarty Firths. Most of the music dates from the 18th and 19th Centuries, when their compos- ers would have travelled between the grand homes and ancient families of the region entertaining them and delighting them by dedicating a tune to one of the household. Two of the tunes are compositions by Alison herself, who also has a family connection with the area. From romantic slow airs, to lively reels and strathspeys or delicate quicksteps and pastorales, these tunes belong to Scot- land’s past, but are still very much a part of the music of our country’s present. Alison Kinnaird has been at the forefront of the revival of the Scottish harp. She was the first player to research the repertoire of the harp in Scotland, and the first to record an album of instrumental Scottish harp music - ‘The Harp Key’ (Temple Records, 1978). Along with Keith Sanger, she co-wrote the first history of the Harp in Scotland - ‘Tree of Strings’ (Kinmor Music, 1993). Her tutor book, ‘The Small Harp’ is enthusiastically used by many teachers and pupils of the instrument. 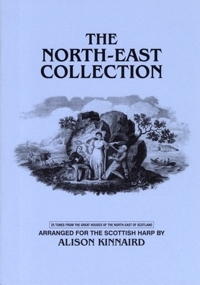 The first volume of tunes in this series, ‘The Lothian Collection’ was published in 1995.